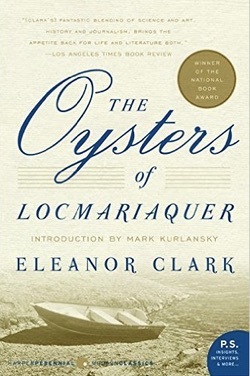 In 1965, Eleanor Clark won the National Book Award for Nonfiction for her work, The Oysters of Locmariaquer, which paints a vivid picture of this small town and of its inhabitants whose lives revolve around the oyster cultivating industry. Please know that Locmariaquer is in the Morbihan, on Brittany’s southern coast, and not “just around the corner from the English Channel,” as the Amazon description asserts. Clark’s prose is not easy to work through. She gives meticulously detailed descriptions of the differences among various specieis of oysters, about the history of oyster cultivation and about the post-war cultivation methods. But if you have the patience and appreciation for her use of language to stick with it, Clark will lead you on a one-of-a-kind journey into the culture of the region and the importance of the oyster industry. If you decide to take give this book a go, please let me know what you think!